ACB reveals shocking GM maize contamination on the South African market. The African Center for Biosafety (ACB) has analyzed most of the South African maize brands available to the average consumer and determined the devastating impact of genetically modified maize on the South African market. South Africa,(SA), is the only country that allows the cultivation of a genetically modified food staple that affects millions of consumers despite the potential for devastating environmental and health consequences. The SA white maize market is controlled by three major food producers. Pioneer’s ‘White Star’ super maize meal has a 25.3% market share, Tiger Brand’s ‘Ace’ super maize meal constitutes 22.5% of the SA market, Premier Foods flagship brand ‘Iwisa’ controls 13.3%, and Premier with its combined brands ‘Impala’ maize meal and ‘Nyala’ maize subjugates 25.5% of the market. The test results, released in October, reveal that the entire maize supply is contaminated with genetically modified corn with the following GM content. Premier’s Iwisa contains 81.2% GM content (labelled as ‘contains genetically modified organisms”)October 2013. Pioneer’s White Star Super Maize meal contains 72,04% GM maize content (labelled as “produced using genetic modification”) October 2013. Premier’s Nyala Super Maize Meal, contains 87.44% GM maize content (labelled as “contains genetically modified organisms”) March 2013. ACE Super maize meal contains 78% GM maize content. ACE Maize Rice contains 70% GM maize content. ACE Instant Porridge contains 68% GM maize content. “We are hugely taken aback and disappointed by the test results for the Woolworths’ Maize Meal as this high GM content and misleading labelling flies in the face of their stated position. Woolworths is on record as stating that their policy is to replace or remove ingredients derived from GM crop sources, or to label the final products containing ingredients derived from GM crops, to ensure customer choice,” said Zakiyya Ismail, ACB’s consumer awareness campaigner. “The majority of South Africans are not only eating GM maize without their knowledge and consent but have no choice or alternative whatsoever even if the products were correctly labelled. This is totally undemocratic and unacceptable. 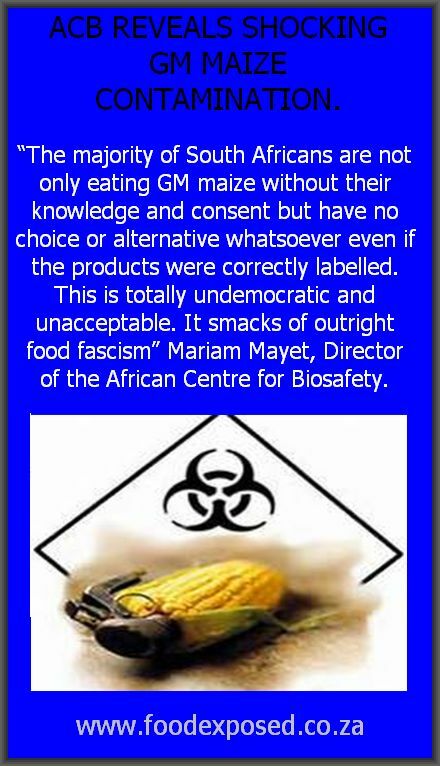 It smacks of outright food fascism” said Mariam Mayet, Director of the African Centre for Biosafety. ← Negative health effects associated with increased levels of Omega-3 Fatty Acids.